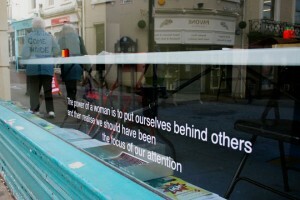 WOW [Women of The World] Festival of Inspiring Women was a vibrant week-long programme of events in Folkestone to mark International Women’s Day, 2015. It was co-curated by Leah, the Quarterhouse and Folkestone Fringe and run in association with the Southbank Centre, London. It featured a packed programme that celebrated the incredible achievements of women and girls and looked at the most potent topics for women today. There were panel discussions, lunchtime talks, activism workshops, a Feminist Folkestone walk, live music and comedy, theatre and poetry performances, as well as an outreach programme to young women at college and school. 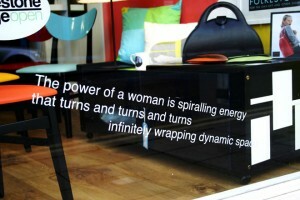 And shop windows in the Creative Quarter overflowed with lines of poetry from a group poem written during the year by women and girls in Folkestone. you (not that I actually will need to…HaHa). You certainly put a new spin on a topic which has been discussed for decades. I was very happy to find this web site. I wanted to thank you for your time for this wonderful read!! I definitely appreciated every part of it and I have you saved as a favorite to see new things on your blog.